Even Nissan employees talk about visiting the home of Nismo, the Omori factory near Yokohama, like making a pilgrimage. Getting to go is a great privilege, and now I have a better idea why. 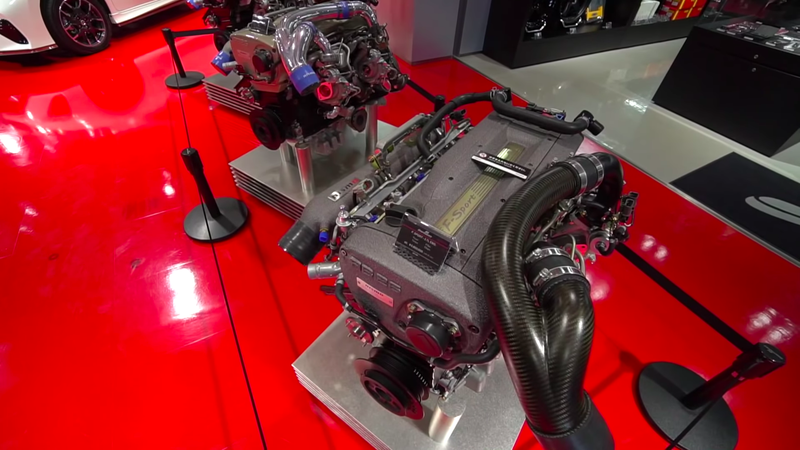 You can turn up, plunk down $51,000 and buy a brand new RB26 engine out of the legendary R34 Skyline GT-R.
Again, even Nissan employees I’ve talked to speak about Omori in hushed tones. It’s where Nissan keeps its historic race cars, and what gets sent out to the rest of the world for display all has to go back to Omori. The R390 GT1 street car lives there, and it was Omori that sent it out Laguna Seca for the Monterey Historics this year. Nobody gets to see that car, but Omori is where it calls home. And Omori is where Nissan does restorations on GT-Rs through the years and where Nissan does its factory-upgrades for various limited-edition GT-Rs. Things like the 400R for the R33 of the mid-1990s that came with a stroker engine from the factory. Only a few dozen were made. So it makes sense that if there’s a place in the world where you’d be able to buy an engine for one such limited-production version, it would be where the cars were made in the first place. This is a roundabout way of saying that you can walk through the front door at Omori and buy $50,000 of straight six. That is, unless you really go all out and buy one of the engines they have for sale there. At the time there were three engines to choose from. The first being a RB26 S2 suited for the R32, R33, and R34. In this guise it produces 400 horsepower. The cost is ¥4,300,000 ($39,230). Stepping up, the RB26 R2 is rated at 450 HP. That extra power comes at an extra cost, of course at ¥4,800,000 ($43,788). Again, it’s compatible with the same cars as the S2. Today notable Nismo-obsessive YouTuber tommyfyeah also swung by Omori and saw that F-Sport engine labeled a cool ¥5,800,000. Practically a steal at $51,200, though it makes it seem like prices are somewhat variable. I went online to see if I could find a place where I could double check all of this and did come upon the official Nismo catalog. Indeed, there are lots of RB26 parts, like a $2,600 crankshaft, among other things. But no complete limited-run engines could I find. The Omori factory website just gives you directions to get to the building itself. I’m very much not in the market for something like this, but I do appreciate how Nissan sets this up, keeping old-school speed parts like this both secret and available. But if I was in the market, I’d look into a plane ticket to Yokohama. It’s as good an excuse for a trip to Japan as any, right?